Once more and again we arrive at end of another school year (though this year has been more trying/intense than most). By that I mean we started the year under pressure and it did not let up until June 7, 2013. 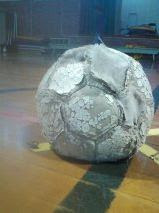 Last year I blogged about and showed you a soccer ball that had an amazing adventure in our physical education and playground. And summed up the willingness of our students endure. Boy did we have a ball this year! We started the year with more than half of our class equipment gone (due to an administrative snafu). We achieved the status of Blue Ribbon, lost the availability of our gym for more than half the year, sponsored a winter chess festival, worked through the passing of our principal just after Christmas, living under the cloud of STARR, working with an interim principal (who was fantastic by the way), sponsoring a school wide field day, unveiling a new gym floor with dragon logo and this is just scratching the surface from our point of view (the other faculty and staff members have a story that would rock your socks). So this year we started out with a brand new soccer ball that "Took a kicking yet kept on ticking". The posting of the image below illustrates the kind of year that the Dragon Community experienced, through thick and thin we endured to cross the finish line victorious!! This is the actual ball that endured the 2012-2013 school year! So the plan now for the summer is to Recoup, Regroup and send our Super Hero outfit to get cleaned and pressed. Until then have a great summer, learn a new skill set to add to your teaching arsenal, tune into the Dragon Network (KDES) every Friday morning at 9:00 am < http://www.ustream.tv/channel/the-dragon-network > and all you Alumni like our Face Book page < https://www.facebook.com/DouglassElementary?fref=ts > > to keep tabs on us! Too Few Teachers Not Connected?